MARIA is a game based on the War of the Austrian Succession, where Austria was attacked by Prussia, France, Bavaria and Saxony, while only Great Britain, Hanover and the Netherlands (by forming the so-called Pragmatic Army) helped her. 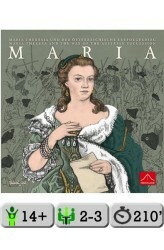 MARIA is primarily a 3 player game. One player is Austria, the second is France plus Bavaria, while the third player has the schizophrenic role of playing Prussia (Austria's enemy) and the Pragmatic Army (Austria's ally) at the same time. This is made possible by the division of the map into two parts, the Flanders map and the Bohemia map. MARIA is derived from the award-winning Friedrich, but has its very own character, including politics, hussars, force marches, imperial election, Saxony's betrayal and Prussia's annexation of Silesia. Subtle man..
1949: Germany, still in ruins from WWII, is split in two, as the Iron Curtain of the Cold War descends. East Germany and West Germany become bitter rivals, each wanting to show its system is superior. Which will reconstruct quicker? Which will make its people happier? Socialism vs Capitalism; collectivism vs individualism - which will triumph? 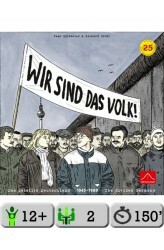 Wir sind das Volk! ("We are the people!" — the main slogan of the East German demonstrators in 1989) recreates the history of the divided Germany, from the Berlin Airlift to the fall of the Berlin Wall. Flowing from how the 84 individually designed action cards are played, each game is different. There are many possible strategies. Will East Germany build the Wall or stem the exodus of its citizens another way? 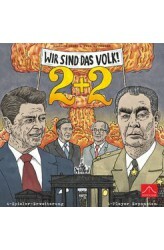 East vs West: as a player, y..
2+2 is a four-player expansion to the award-winning Wir sind das Volk! that broadens the original game to the global Cold War from 1945 to 1989. Players form two partnerships: the USA and West Germany versus the USSR and East Germany. However, there can be only ONE winner! This fact makes every decision a nail-biter: What is more important right now? Your side's interests or your own? The forty new action cards add events like the Cuban Missile Crisis and the SALT treaties. The range of strategic choices is significantly wider, making 2+2 a completely different game. As a superpower, you want to gain global dominance, win the space race, and increase your living standards to demonstrate the superiority of your system. Never let the other side get too far ahead in the arms..